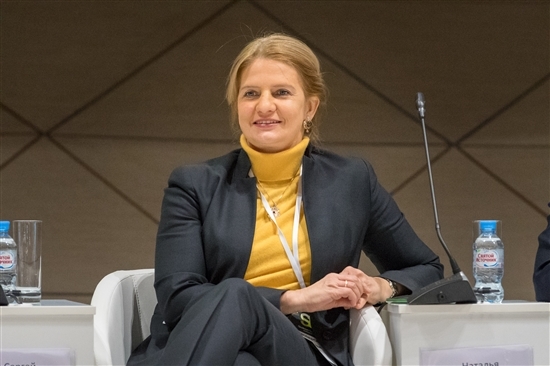 The fourth annual CyberDay conference devoted to cybersecurity got underway at the Skolkovo Technopark on Friday, the 30th anniversary of the establishment of Computer Security Day. Skolkovo Foundation chairman Arkady Dvorkovich speaking at the opening of CyberDay. Photo: Sk.ru. Topics at this year’s event, aimed at establishing new technological approaches and solutions to ensuring information security at every level of a company’s business processes, include challenges and opportunities of the future of cybersecurity, the transformation of threats and evolution of defence methods, machine learning and artificial intelligence as new ways to ensure cybersecurity, and bug bounty programmes, under which users receive rewards to reporting bugs. 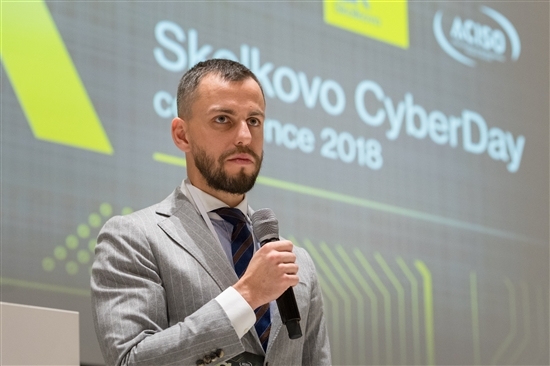 “Interest in the problem [of cybersecurity] increases with every year,” said Sergei Khodakov, operations director within the Skolkovo Foundation’s IT cluster, which organised the event together with the Association of Information Security Service Heads. The number of participants in this year’s event was expected to grow by a third compared to last year, to over 1,000 attendees, he said. “With the proliferation of technologies such as the Internet of Things and cloud technologies, this topic will only become more relevant for all market players,” said Arkady Dvorkovich, chairman of the Skolkovo Foundation, welcoming participants of CyberDay on Friday morning. Speakers at the conference include Natalya Kasperskaya, president of InfoWatch and co-founder of Kaspersky Labs; Ilya Sachkov, CEO and founder of Skolkovo resident company Group-IB, and his co-founder Dmitry Volkov; Alexei Sokolov, deputy minister for digital development and communications; Sergei Belov, head of product security at the Russian email giant Mail.ru; and Artyom Sychev, first deputy director of information security at Russia’s central bank. Participants of the CTF cup, in which teams of young cybersecurity students battle each other. Photo: Sk.ru. One of the problems the world is facing right now is a lack of qualified cybersecurity specialists, said Stanislav Kuznetsov, deputy chairman of the board of Sberbank. Around the world, there are on average 30 percent fewer specialists than needed, he told the conference. Sberbank has eight agreements with top Russian universities and is working with them to develop joint educational programmes in the field of cybersecurity, added Kuznetsov. The two-day event also comprises the Cybersecurity Challenge, an international competition for innovation projects designed to protect the world from cyberthreats. The top three companies win financing of 5 million rubles ($75,000) from the Skolkovo Foundation, and access to advice from leading experts in this field. “The Skolkovo Cybersecurity Challenge enables us to find promising early-stage projects and give a real boost to their development,” said Khodakov. “This year we have invited as competition partners a larger number of businesses that are clients for such services,” he told Sk.ru ahead of CyberDay. Natalya Kasperskaya, president of InfoWatch and co-founder of Kaspersky Labs. Photo: Sk.ru. “The jury includes representatives of Sberbank, Rostelecom, Norilsk Nickel, and other major companies interested in searching for information security solutions that could be used in their infrastructure. From this perspective, the competition could rightly be considered a fast track to being introduced at a potential client-company,” said Khodakov. Companies that have won the CyberDay Challenge in previous years have gone on to great success. In 2014, the competition was won by Wallarm, which provides AI-powered application security. Two years later, the company’s founders went on to win a place on the prestigious YCombinator accelerator programme in California. Last month, the company closed an $8 million series A financing round in San Francisco, bringing the company’s total funding raised to $10.8 million. Wallarms’s executive director Anastasia Novikova is among the speakers at this year’s CyberDay. “The success story of Wallarm, which was listed [number 7 in the security category] among the top 5,000 fastest-growing companies in North America, is a model example of what prospects winning the Skolkovo Cybersecurity Challenge opens up for startups. Thanks to the competition, participating companies make a notable sprint in their development,” said Khodakov. Ilya Sachkov, CEO of Skolkovo resident Group-IB, which helps companies to protect themselves from cyberattacks. Photo: Sk.ru. Another of the winners in 2014 was a spinoff of Skolkovo resident Group-IB that received funding from Skolkovo and whose technology, the Secure Bank product, is now in use by the state bank Sberbank, and was launched for international markets earlier this year. CyberDay also includes the CTF (Capture the Flag) cup, which is taking place at Skolkovo for the second time. Twenty teams from all over the country – the winners of the regional stages of CTF, an information security competition for school pupils and students – will fight it out in the Technopark for the final. “One of the teams protects the information assets, while the other attacks them,” said Khodakov. Skolkovo's Sergei Khodakov, who organised the fourth annual CyberDay event at the Technopark. Photo: Sk.ru. 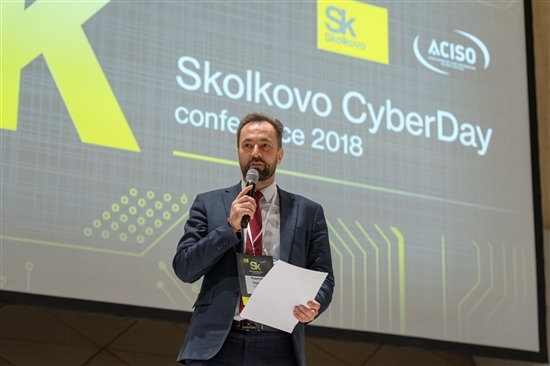 Sberbank’s Kuznetsov welcomed the competition as a move to reducing the deficit of cybersecurity specialists in the country, and thanked the Skolkovo Foundation for its role in organizing and hosting the conference and competitions. “Skolkovo is one of the key spaces in the country that allows us to cultivate these important startups that our country needs so badly,” he said.